My final heat is, on paper, the hardest of them all. Back on the standard circuit (just two hours after I finish my third round race), I meet Mathias Grooten and Annelien Boutens for the second time this championship. I will also be racing Matt Bartsch, fourth place overall in the championship last year, and Sebastian Raikkonen for the second time in two years but I had very different fortunes with both of these drivers last year… Arnaud Tinet also returns to BRKC; I last raced him in round two in 2015 and I’m hoping, with my added experience, I may be able to challenge him for position this time around. Writing this, I am having difficulty making my prediction for the heat winner; with the level of competitors in this field, it will come down to who qualifies best and manages to hold their nerve through the twenty minutes of racing and the all-important pit stop! On Sunday, I will be up early for the second race of the day, again on the alternate circuit. I will be racing four of the same drivers that I lined up against in 2016; David Longman, Ramon Pineiro, Ben Churchill and Tyler Mays. I seem to remember being in a close battle with Ben Churchill in round three last year; that time he got the better of me, but I’m determined to put that right this time around! There are some very good drivers in this heat; Ryan Smith made it through to the semi finals last year and David and Ramon just missed out, but in my eyes, the one to watch in his return to BRKC is Mathias Grooten, who won all of his heats in BRKC 2015 and narrowly missed out on a podium position in the final. On to round two, and the brand new alternate circuit, which we will have to watch the first five heats and get as much information as possible from the drivers in those races to try to get the upper hand here. In this heat, I meet the one driver that I have raced in both of my previous two championships, Robin Kassam. Both of the two previous occasions have been in round three and on the standard circuit. Robin currently leads 2-0 in this battle, but I am determined to at least make a fight of it this time! Also in this heat are Regis Gosselin (a finalist in last year’s BRKC), Jacob Lewis and Chris Machell, all of whom I raced last year. Last year, I managed to do the double over Chris, but I’m sure it won’t be easy to do the same this year! I’ll be the first to admit that I have had problems with alternate circuits in previous years, but hopefully this year will be different with more experience and hopefully a clearer mind. Happy New Year to all of my readers! First, an apology. Due to life being so hectic in the second half of 2016, I have somewhat neglected this site, but I will be backfilling the posts that I have missed over the next few months – there’s another trophy in my cabinet to tell you all about! Secondly, and seemingly out of nowhere, came the #BRKC2017 draw on the evening of Saturday 14th January. This, like the previous two years, was my first opportunity to find out who I would be facing in the first four rounds of this year’s championship. I waited patiently for my name to be called and eventually (I was the 53rd driver pulled out of the bowl) I could see how my heats were lining up. However, with the heat dispersal system, only after the last driver was drawn were all of the heats finalised. The image below shows the full draw (with my races highlighted). Each day this week, I will focus on one of my races, starting with Round One, Heat Six tomorrow! A spur of the moment decision to go karting in the member’s 3-4-2 session on a Friday evening (whilst my wife was away), took me back to Eastleigh with my friend Mike. I couldn’t believe that this was my first time karting since my 9th place finish in the KartChamps grand final (I had spent some time in Germany and Denmark with work immediately afterwards, so didn’t have the time to take part in any of the sessions that I would normally participate in). There were only three of us in the members’ session (myself, Mike and Connor), meaning that there was a lot of space out on track (if you wanted it). I did want a bit of space at first, so allowed Mike to get away and then I planned to chase him down in the laps to come. I’m not going to lie, but the kart I had been given didn’t feel great from the first corner; slipping and sliding around underneath me, but I persevered with it and a few laps later, a little bit of grip did appear in places and I set out in pursuit of Mike. Unfortunately, although I did close the gap slightly, I didn’t quite have enough time to catch and overtake him before the end of the session. After the first session, the three of us decided that we would rotate the three karts used in that session, so that by the end of the evening, each driver would get the opportunity to drive each kart once. The second session went pretty much the same way as the first; Connor was able to pull away from myself and Mike, whilst we “battled” it out for position on track. Again, I wasn’t thrilled with the kart’s performance, but I did all that I could to be competitive in it, knowing that I would have an opportunity to deliver a fast lap time in the last session. With all of that taken into account, both myself and Mike came off at the end of the session having enjoyed every minute of it, especially the sportsmanship between the two of us swapping track positions at the end. I finally got myself chance to drive kart 14 in the last session, which I was very happy about (although it was freshly refuelled just before the session). Compared with the other two karts I had used this evening, it was far easier to drive and be aggressive through the corners. I tried to manage the gap between myself and Connor in the early part of the session, but eventually he broke free and then I had to just concentrate on putting clean laps in to better my lap times and attempt to get on the best time of the day/week/month lists! I was really pleased with my performance in the final session, which also placed me (at this very early stage) as holding the third best lap time of the month. I do have a strange feeling (and maybe a little bit of a lack of direction) after the KartChamps finals. This isn’t a new feeling for me; I usually feel some emptiness after the BRKC, because it is so physically and emotionally demanding over those three days. I really have the urge to try something new, whether that be a new track, a new championship/event or something completely different in motorsport (maybe going for my full racing licence). One thing that I know that I definitely will be putting my efforts into is trying to acquire sponsorship to help to fund whatever step I take next. 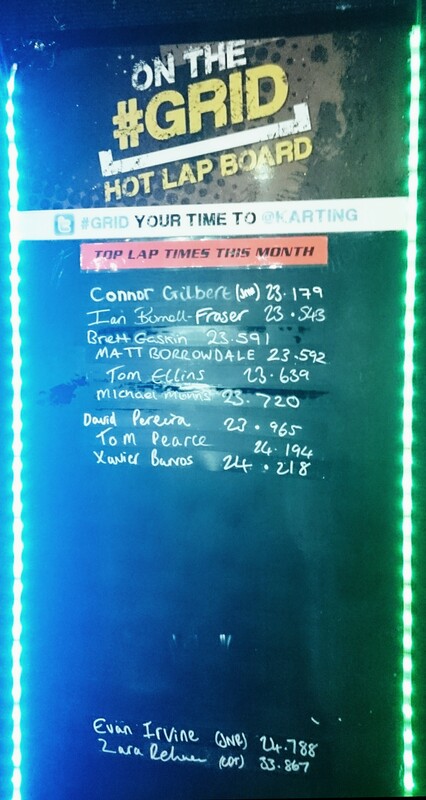 After the two evenings of practicing this circuit in the week preceding, this was the day of the KartChamps Heavyweights Grand Final. 16 of the best karters in the southern region had qualified for this event out of many drivers at each of the ten Teamsport tracks in this region. The out-and-out favourite for the title had to be Ian, my friend and rival from Eastleigh and Gosport, but the competition seemed very open for all of the other drivers to make a play for the other podium positions. Heading to Reading straight from work, I arrived early and tried to relax a little but I could feel the adrenaline building in anticipation. I still can’t seem to manage to get myself in the right place mentally before these type of events; sometimes I get too worked up before a race and then struggle to maintain the level of focus required by the time I get into the kart and on a couple of occasions I have been so successful at chilling out that it has been a real effort to get the energy up during the race. Anyway, after a briefing by the race director, we were split into two groups for practice and qualifying. My group consisted of the karters from Gosport, Eastleigh and Reading. The practice session was quite short, but I tried to use it as an opportunity to test as many possible scenarios as I could, including trying to work out which line was defensive enough that I could ensure that I didn’t lose any positions if I found myself leading the races at any point, and also trying to learn from Ian (who I could tell was in imperious form right from the start). I finished with the fifth fastest time in the opening group with a 58.496s lap right at the end of the practice session. With the single flying lap qualifying coming up, I knew that I would have to improve and hold my nerve to give me a chance in the heats. I was glad to have the “formation lap” as this did settle my nerves a little and give me an opportunity to test the kart’s braking, steering and acceleration (as much as it was said that the karts were equal, each kart I had raced here had very different handling). You can see in the video below that I did get twitchy before I was released for my flying lap; flexing my throttle foot, fiddling with my gloves and stretching my neck. At the time (and even looking back at the footage), I knew that it wasn’t a very clean lap and I was amazed to have posted a 58.326s time, which put me third within my group. After all of the qualifying times were in from both groups, two further groups were formed for the heats and, yet again, I found myself with Ian but all of the other drivers in our heats were from the second group. In the first heat, I started 6th out of the seven drivers, but it wasn’t quite as straightforward as that; after driving out of the pits, the brakes on kart 12 didn’t appear to be stopping the kart and this only seemed to get worse in the heaviest braking points on the circuit. A quick kart change on track and another formation lap and we were ready to go. On a track that known not to be the easiest to overtake on, I did attempt a couple of lunges in the first few corners, but none of them paid off. The top floor of the track has always been my strongest due to its similarities to the “snail” at Formula Fast in Milton Keynes. However, this also proved to be my undoing – travelling too fast and colliding with the kart in front (who had got caught behind the driver in front of him) on the apex of the corner. I desperately tried to catch up to the back of the pack, but the damage had been done and I finished in the same position that I had started (despite putting in a 57.447s lap during the chase). I knew that winning the next heat was imperative to stand any chance of qualifying for the “A” final directly (and even then, that might not be enough!). The chances of me doing this were helped by the fact that it was a reverse grid and that the driver who should have been starting on pole had pulled out. I found myself in a position I had dreamt about for many years, but never really achieved it at this level; leading out a heat with a field of very good drivers. I had planned for this exact eventuality; I was going to hit every apex of every single corner, every lap for the 7 laps of the race, not giving anyone the chance to slip underneath or over the top of me. And that is exactly what I did (bar one minor mistake) for the first three and a half/four laps. I could see that I had Ian charging behind me, so I made a tactical decision to allow him to slip past me and then I would follow, hoping that he could also pull me away from the rest of the pack a little. I was, however, fuming when I was taken out at the next real corner by a very aggressive lunge up the inside whilst I was turning in. I went absolutely ballistic; I was gesticulating to the marshals and wanted to catch up with him just to knock him of the track. Reviewing the footage back at the track after the race proved what I thought had happened at the time; the driver didn’t even really turn in until he had collided with my kart. After the race, and having spoken to some of the supporters that had come from Eastleigh and Gosport, they recommended that I spoke to the race director and show him the footage. I wasn’t sure whether it would make any difference and I, personally, don’t want to be known as someone who complains when things aren’t going my way (I’ve experienced a number of those kind of karters during the past few years). Eventually, I did and the race director agreed and said that I would receive the points for second place for that heat. My points tally wasn’t enough for me to make the “A” final, so I lined up right in the middle of the “B” final (the tiebreaker for equal points being our initial qualifying times), needing to win to have a shot at the title. From my point of view, this was the most enjoyable race overall (although I loved leading for three laps of the last heat). There was always something to keep each driver interested despite there being no overtaking at all in the race. I pulled alongside the driver in front of me a few times during the race, but always found myself on the wrong side going into the next corner. I loved the challenge, and although I didn’t manage to improve from my grid position, the challenge was enough of a reward. I put in my fastest time of the evening toward the end of this final, a 55.612s lap, which was another positive that I took from the race. After my final was over, it was time to support Ian in his efforts to continue with his 100% record during the evening and win the big one; the KartChamps2016 title. From the start, Ian pulled away and there was nobody on track who could even come close to him. There was still a little bit of tension amongst his supporters, because one mistake could have cost him the title. But as the laps counted down, the tension turned into celebrations as Ian brought the title (and the trophy) back to the south coast! I was immensely proud to have finished 9th overall against this level of competition, but next year, I will be aiming for the podium!